Chicken soup for the universe. We may have been taught that the universe is 99.99...% hard vacuum, but according to this New Scientist article, which I found through a link in Alan Boyle's ever-helpful Cosmic Log, some physicists at Stanford, MIT and Harvard believe that "vacuum" may be a "string-net liquid" that could be analogized to noodles in chicken broth. What's particularly interesting about this article is how it shows the interplay among theoretical, experimental* and applied physics, as well as geology. It has been proposed that a mineral called herbertsmithite, found in the Chilean Andes, may be an example of a string-net liquid. The possible application, being explored by a group at MIT, is to quantum computers, which would be much faster and more capacious than silicon-based ones. *The late Nobel physics laureate Richard Feynman explained the difference between theoretical physicists, like himself, and experimental physicists with this anecdote: He was giving a lecture at one of the Lawrence laboratories in California, where his audience consisted mostly of experimentalists. He referred to a fairly recently discovered particle, and said, "Let's assume its spin is two and one half." He was immediately interrupted by a voice from the audience with a heavy Brooklyn accent, saying, "Hey, it ain't two and a half, it's tree. Dey measured it." It's looking grim for the Mets. OK, they were split squad games, but losing to the Nats 13-1 and the Orioles 9-0 looks awful in any event. I'm not so worried about Park and Sele getting hammered; neither is likely to make the starting rotation. What's really scary is that Messrs. Beltran and Delgado, more than halfway through spring training, sport batting averages of .216 and .227, respectively. Bad Astronomy links to a "snarky celebrity site" (and I link to Bad Astro linking thus; so does the Great Chain of Being advance by another link). Anyway, it's good to know that Eva Longoria is not a gnome, and that Marcia Cross and I are exactly the same height. ... "how to get along with a self-absorbed man". I'm sure s/he left this site just as perplexed as when s/he arrived. A Dutch subject, but in a French style. 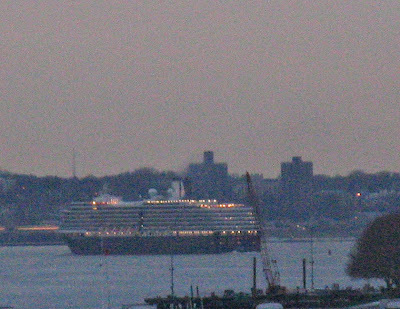 This photo of Holland America Lines' Noordam, making her way at twilight past Staten Island towards the Narrows and the ocean, taken from the Brooklyn Heights Promenade and severely cropped, brings to mind the pontillism of Georges Seurat (click on the photo to enlarge and get the full effect). Sal's retired, but the Erie Canal still hauls freight. 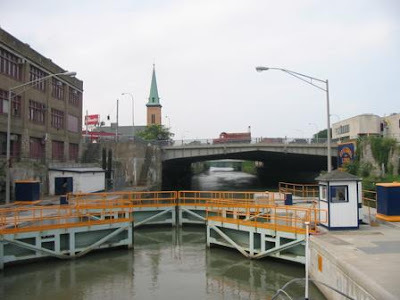 Last year I posted a piece about Red Hook, Brooklyn, in which I explained how the Erie Basin, an artificial harbor there, got its name from its use in the nineteenth century as a transshipment point for grain from the Midwest that had been carried by barge from the Great Lakes, across the Erie Canal, then down the Hudson to Brooklyn, where it was loaded onto oceangoing ships for far away destinations. I had assumed (yes, I know the derivation) that railroads and trucks had long ago put an end to any carriage of goods on the New York State canal system, and that these historic waterways were now used only by pleasure craft, including the tourist boat on which my wife, daughter and I made our way through the locks at Lockport, New York (see photo below, as the gates of Lock 34 open and the World's Widest Bridge looms ahead) the summer before last. So, I was delighted to find this NPR piece, which shows that there is still cargo traffic on the canal system, and that it is increasing. Note: I've updated this link to replace one from 2007 that had expired. ... but the story beneath it is a bit unsettling. Consider how fortunate was the Tunguska event. If the most likely thing had happened, that is, the asteroid had landed in an ocean, there might have been catastrophic tsunamis. If it landed in a populated area, thousands or even millions of people could have died from the force of the impact. Instead, it landed in a vast, largely unpopulated land area.